The International Living Future Institute (ILFI) – St. Louis Region Collaborative is now a part of USGBC-Missouri Gateway! Join us to celebrate this exciting partnership and the launch of our new ILFI committee on August 2nd at the area’s newest building pursuing Living Building Certification, the Jan Phillips Learning Center! The Jan Phillips Learning Center is a living example of the ILFI’s programs. Owned by The College School, the building is currently seeking Living Building Challenge Certification and features semi-permeable pavers, rainwater collection systems, solar energy, 360-degree views and a strong commitment to hands on learning for students. Please note this event takes place immediately after our 2-4 pm seminar on the Living Building Challenge and the host building, which is offered for a fee. More info on the 2-4 pm JPLC Living Building seminar available here. The Launch event is FREE! If you have any questions, or you’re interested in getting involved with our new ILFI committee, please contact hope.gribble@mobot.org. The Living Building Challenge (LBC) is a building certification program with rigorous green standards; certification from this program denotes the highest levels of sustainability and efficiency for the built environment. To be certified under the Challenge, projects must meet a series of performance requirements over a minimum of 12 months of continuous occupancy. Three levels of certification exist: Living Building Certification, Petal Certification, and Net Zero Energy Building Certification. 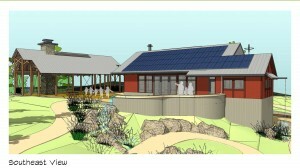 Projects obtain Living Building Certification by attaining all twenty Imperatives; Petal Certification by satisfying the requirements of three or more Petals, including at least one of the following: Water, Energy or Materials; or Net Zero Energy Building Certification by achieving four specific Imperatives, including net zero energy. There are currently 40 certified projects spread throughout more than a dozen countries around the world. The Living Community Challenge takes this one step further by applying LBC concepts to entire communities or cities. In this seminar, attendees will examine a variety of buildings at educational institutions in the Midwestern and Southeastern US which are pursuing or have achieved Living Building Certification, including: The College School’s Jan Phillips Learning Center, a pre-K-8th learning center located on the school’s LaBarque Creek campus with added educational features to teach students about sustainability; Knox College’s Green Oaks Biological Field Station which is located off-campus among native forest, grassland, and one of the Midwest’s most successful prairie restorations; Washington University’s Living Learning Center which tied to be the world’s first Living Building; and Berea College’s Deep Green Residence Hall. The concept of Living Communities will also be explored in this lecture. 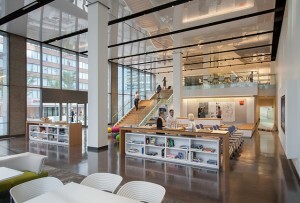 The 13th Annual LEED Showcase will examine projects that have taken the plunge and decided to pursue either LEED Version 4 or Living Building Challenge Certification. 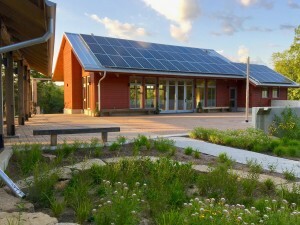 The Jan Phillips Learning Center at The College School is one of a handful of projects in the nation that is pursuing the Living Building Challenge. The learning center will boast net-zero energy use, net-zero water use, solar arrays, composting toilets, locally sourced materials, natural ventilation, and zero use of “Red List” chemicals in building materials. The Maplewood Fire Station is one of the first projects in the Chapter’s territory pursing LEED v4 which, starting in October of this year, will be the only available LEED rating system available for registration. The new station will replace the existing fifty-year-old station, and provide a new home for Maplewood’s fire fighters. HOK’s St. Louis office is aiming to become the city’s first LEED v4 Commercial Interiors (CI) certification. The vintage building housing their new office space has been transformed using a variety of sustainable design strategies. 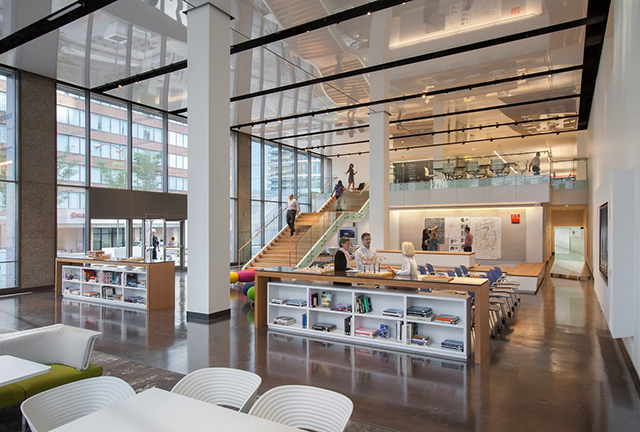 Features include daylight harvesting, energy-efficient lighting, open office layout, bike storage, use of local, recycled, renewable and low-emitting interior materials, and more. We will hear about their motivations to use these rating systems, design and construction features helping them to achieve these certifications, and any hurdles that they have had to overcome. Thanks to our Evening Program Sponsors!